This benefit applies to installation, on-going maintenance and test and inspection. Even the most complex rope access anchorage systems will probably be between 10% and 25% of an equivalent cradle system. This is also carried forward to the building fabric preparation which is often a hidden cost. This might include strengthening by design some areas of the building, especially those that are by necessity near the edge a nd modern designs often have cantilevered-type construction. There are also the additional costs of sealing the roof membrane or fabric. Testing and inspection costs are often cheaper too. Most rope access systems are designed for pre-use checks by qualified operatives and 12-monthly testing regimes. Simplicity of the system allows for this normally. It is not just frequency that makes inspection cheaper; often testing is more straightforward with simple torque or pull testing of relatively few bolts/rails or dedicated points. Tagging could be more expensive because you have to identify all points of anchorage as per BS7883. The cost of system insurance to the building owner is another factor to consider. It is probably cheaper to insure a system with a lower overall value and one that is simpler and smaller. What about the cost of maintenance and repair? In a rope access system there are considerably fewer moving parts, nuts to grease, motors to service, rubber to replace and wires to replace as a fixed cost. Another area is the cost of the overall coverage of a building by its access means. There are different frequencies of cleaning and maintenance requirement. For example windows will need cleaning on a frequency dictated by the way they look or the amount of light that any dirt obscures. Typical cleaning frequencies are between 4 and 8 weeks externally, up to 12 months internally. Other building fabric cleaning may be dictated by the warranty given to it by the installer or manufacturer. Typical intervals may be every 12 to 24 months. This variety of access requirements could mean that the lower overall cost of a rope access system becomes more attractive. It could be argued that to have more expensive, higher maintenance hardware standing idle for long periods of time is not cost effective in this case. This point may not be considered very important but it is in the eyes of designers and architects. It is easier to disguise a rail or series of bolts against a skyline or façade. It becomes far more important with complex roof designs like St Georges Warf, London. With properly designed rope access systems there should be less damage to the roof membrane or structure. This is quite logical as you have only the weight of a person on a roof structure. 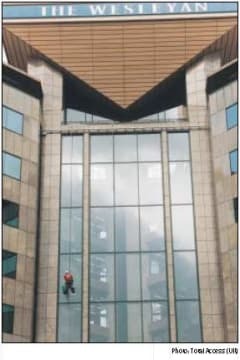 One example of this is a building in Birmingham, UK, where we retrospectively fitted a rope access system to avoid any further problems of leaks caused by a cradle system that disturbed and broke through a membrane to the point of leaking. Now for a drawback: without proper care repeated rope access operative traffic or the pressure of ropes may damage the parapets of buildings. Proper provision to avoid this happening is essential and must be made in new system design. Assessment of parapet structure on existing buildings combined with the provision of proper edge protection has to be made and this might include the use of temporary A frames or rope protection cages. The vertical face of a building will generally suffer less damage from the passage of rope access workers in comparison to cradles. This is a result of the controllability of a rope access worker even in windy conditions, the ability to absorb small bumps with building fabric and control movement by closer contact. Even when fitted with rubber buffers a cradle has the potential to cause a building more damage. Some have found that cradles swing around to a greater extent even when used with intermediate securing points sometimes used on cradle systems. Sloping glazing or fabric is quite difficult for cradles to deal with especially if they only form part of an overall drop i.e. there is a change from vertical to angled part way down (indeed any change of angle in or out). When cradles are used in this situation it normally requires the use of rails to locate it or a totally separate system. Rope access can usually cope with several changes of direction by the provision of a re-belay point or two for undercuts or over-hangs; in the case of sloping material no additional provision is required as long as the designer provides for man/weight pressure. Anchorage versatility is also a strong feature of a rope access system with considerably fewer anchors necessary than for cradles. A well designed rope access system can use structural features or members not necessarily close to the edge of a building. With proper rigging a greater area of the building can be accessed. It's also possible to place a rope access operative where necessary in the third plane, i.e. away for a facade by the use of a triatic or cableway. This gives access to features that protrude irregularly that need maintenance or cleaning e.g. lighting units, signs, flag poles, decorative features, and canopies, etc. Flexibility in the number of operatives on a site at any one time is another plus point. The number of anchors available is the only factor that normally limits the number of rope access operatives. This has distinct advantages by shortening the time needed for the use of temporary redirection of road or pedestrian traffic or when roads and other features need to be completely closed. It could also be argued that the less time an area has persons working at height means that there are less people moving underneath and therefore the overall risk is reduced for all concerned. With any upgrading, replacement or moving of roof mounted services such as heating, lifts and air conditioning, etc the potential for rope access systems to quickly adapt to these changing situations without major disruption or cost is considered valuable. Construction Design & Management requires us to look at the overall life span of a building from construction to demolition. In the construction phase rope access system elements are normally quicker, lighter and simpler to install. These aspects have beneficial consequences in terms of reduced lifting requirement, reduced personnel time on site, reduced requirement for electrical or other power supplies both at installation and ongoing, easier lightning conduction requirements and less overall load on the actual structure. Using trained rope access operatives installation can also be done with scaffolding in awkward areas. In the demolition phase many of these advantages can also be applied. In the majority of cases rope access puts the operative in closer contact with the building fabric, and should be designed so. This closer contact and more personal resistance to the natural reactive force allows for greater pressure and attention to the cleaning method thus ensuring a better quality of clean. Overreaching is a problem often experienced in cradles. There is also a more tailored approach with the ability to finely adjust the operative's position with a rope access system. This could mean that fewer areas will be missed during a clean. In a similar vein, within the safe limits of rope angles and proper rope protection, a rope access operative can reach more building fabric per position, again leading to greater quality. Set up, moving of principal anchorage area and de-mounting time for a rope access system is quicker. Roof top areas are open for shorter periods of time, workers exposure to other roof top hazards such as biological, falls and trips, Non Ionising Radiation, mechanical, etc is reduced as is the risk of third party interference. Movement on the task is quicker per person. This aspect also has the added benefit of reducing the time each worker is exposed at height, giving a time weighted reduced risk benefit. Add to this the reduced overall disruption time to the building users, entrances and exits being blocked, cleaners peering in at office workers and vice versa, car parking spaces being occupied by exclusion zones, etc. Unless fully enclosed, such as with fixed and sheeted scaffolding, most forms of access are susceptible to adverse weather conditions. If in this regard all things are equal then rope access does have an advantage over most other forms in that the ability to retreat is quicker and the opportunity to retreat/return to an exact work position having rested/dried off/warmed up/cooled down, etc is quicker. Rope access is quantifiably proven to be a safe form of access. It will stand up to comparison with any other means of access and prove as safe or safer. IRATA statistics collated over the past 10 years shows an accident rate of less than 4.7 / 100,000 hours worked. This includes incidents not currently reportable under RIDDOR. This figure would stand up well against working at ground level and any other working at height activity if similar comparative figures are available from specific industry groups representing other such interests. There is some argument that suggests cradles have handrails and toe boards and should therefore be considered a guarded means of access. At the end of the day all of this is still suspended on the end of a wire. We could, of course, use ropes in a similar fashion but would probably have to change them out more frequently! You are less likely to fall out of a well fitted rope access harness than you are a swinging cradle whether wearing a fall arrest harness or not. You will also benefit from a trained and independently assessed workforce. As a single access method, and there are very few differences geographically, no other access system has such strict control measures over the methods employed and the visible, agreed and ascertainable levels of competence. No single training scheme for the many varieties of cradle system available exists. A building owner asking for proof of competence to operate a specific type of cradle system would only have recourse to the manufacturer and it is entirely possible, therefore, that cascade training on-site could be the norm. The argument presented is that cradle systems are simply a matter of 'get in and press the button'. We would suggest that the use of a mechanically complex, normally electrically fed piece of machinery that still requires the understanding of personal fall arrest equipment holds greater training requirements and risks than the above statement allows. Rope access operatives, through the intensity of their training programme, should have a greater awareness of all working at height issues thus adding to overall working at height safety on a building. Mounting and dismounting - Cradles may have the perceived advantages here, with dedicated access points, gates, etc or the ability to be mounted before preceding over the buildings other edge guarding measures. However a properly designed rope access system can enjoy these benefits and indeed have the advantage of operatives being fully attached to the suspension and protection system at all times. Rope access also has the advantage that the system can be fully and safely exited at the bottom of a building, often over an obstruction, leaving nothing but ropes behind. Rescue - All rope access teams have the built-in ability to selfrescue. We all recognise now the risks of suspension trauma (especially Insurance Companies!) and rope access systems address this issue head on. Is there a suitable provision available in a cradle system in the event of a disabled/broken lowering and hoisting system and an operative hanging out of the cradle in a fall arrest harness? Cradle breakdowns normally involve the calling of a third party e.g. the Fire Brigade. Then there is the additional risk to these persons and the additional waiting and exposure time for the trapped or injured cradle operative. Inspection and maintenance of access equipment - There isn't much to a rope access system that can be considered a permanent feature other than the anchorage system itself; this element rarely has any moving or electrical parts. This has added safety benefits in that a cradle's associated equipment can be exposed to either long periods of weathering or inactivity. Rope access equipment, even in between the statutory inspection periods agreed under LOLER, has the advantage of being used on multiple jobs and is therefore both more regularly inspected and replaced. Rope access systems do not usually require the provision of electricity (or any other power means) at the point of work. This would represent both a cost saving and a reduced risk. Standing in a cradle may be considered comfortable by some but others would argue that being properly seated in a rope access comfort seat and harness would rate above this. This would have to be decided for yourselves through research or experience! If we have adequately covered the safe 'containment' of operatives successfully then the issue of materials is equally important. For general cleaning the perception that vast quantities of water and cleaning fluid is needed to provide a quality clean is a mistaken one. Low quantities of liquid are required for considerable areas of cleaning. For example: 3 litres of cleaning mix weighing 2.5kg will clean a full 2m wide drop of an 18-storey building. Products such as Unger's Bucket on belt and the use of tool tie backs and lanyards often make rope access systems more responsive to safe materials and equipment containment. In well organised rope access systems materials and tools for heavier maintenance and cleaning operations are normally suspended by independent control systems (ropes or wires). There is little temptation, by virtue of the personal nature of the access system, to overload it or use it at height without correct independent attachment for additional items. This reduces the risk of falling objects, something that is very important to architects planning buildings surrounded by projecting fragile lower storeys. This issue needs careful consideration with the provision of any access system. The likelihood of individual building fabric panels or window units needing replacement is low, especially when considered in the overall lifetime of a building. However it can and does happen and should be planned for. The first step, after ensuring that all has been done to prevent the need at all for this by material design and selection, would be to allow for the window units to be removed from the inside of the building, and of course this is not always possible depending on the spread of window units across floors, etc. Most access systems can be used to assist with removal and replacement in these circumstances though. The natural benefits of having rope access operatives close to the building and independently adjustable in their position offer the already stated benefits over other systems. Where window units and building panels are to be replaced from outside then their relative height is important. Cranes are the normal means of replacement part lifting but sighting them and their ability to reach heights over 60-80 meters is usually limited. Rope access is well suited to support this sort of lifting activity. The limits arise not with weight but with the ability to achieve the sighting of the crane in terms of its overall size against its ability to reach the height required, i.e. the effective stand-off. Designers should be aware of this especially where there are narrow roads, very busy highways or other obstructions such as soft or uneven ground. Where a building has window or fabric panels that can't be replaced from the inside, handled safely by independently suspended temporary lifting systems or accessed by crane consideration should be given to a combined person cradle/unit handler. There could still be a problem when requiring the operatives in the cradle to lift a unit up into position, unless the unit has been designed specifically for this purpose. General maintenance of structures of either brick or concrete can often require repairs that are very area specific such as brick face break down or concrete spalling. Rope access is a proven and successful method here. The formula of size of repair, distribution and number of repair sites over the number of visits required to the site often prevails in favour of rope access in terms of safety and cost. This equally applies to painting activities and inspection. This could also influence the initial choice of access system.